Today’s interview is with 1SG Tony Luzzi of the 106th Army Band. He is going to share his experience while serving as the Army Physical Fitness Training Unit NCOIC. I hope you enjoy the interview. What job did you have and who did you serve with and when? Through my years in the 106th Army Band, Arkansas Army National Guard, I have held many positions within our unit. I believe the one that I am most proud of is NCOIC of our unit’s physical fitness training, Army Physical Fitness Test, and the Army Weight Control Program. I held the position for six years and learned many things during that time. Can you give us a brief job description? As the NCOIC of physical training and weight control, you are in charge of the general physical fitness of the unit. Not only are you to develop training programs to help your soldiers attain their fitness goals, you are to also give them guidance on how to maintain their fitness after the goal has been met. You are also responsible for the administering the APFT, assembling the grading team, training the grading team, organizing DA Form 705s for scoring, recording the scores, issuing counseling statements, and keeping up with diagnostic testing to monitor the progress of those struggling with their physical fitness. As for weight control, the NCOIC is responsible for weighing the unit, recording the results, taping soldiers, issuing counseling statements and monitoring the progress of those struggling with their weight control. What 3-5 tasks took most of your time? Paperwork – There is NEVER enough time! There are only so many hours in the drill weekend. You scramble as fast as you can to get the job done, but there is always something else that comes along to steal your time. As a leader, I understand that this job requires time outside of the drill weekend. With that in mind, be prepared to do what it takes to get the job done. Annual APFT – Assembling graders and materials. It takes time to assemble a grading team. To coordinate a time for graders to take their APFT, then grade the unit’s APFT. Our unit is rather small, so building a team that can do it can be trying. We have such a great team of unit personnel; everyone is willing to help and the outcome is always good. As for materials, you will need clipboards, pencils, stopwatches, mats, water, cups; the list goes on and on. You must plan ahead to be successful. Hunting for materials on APFT day illustrates disorganization and no one needs to see that. Counseling – Counseling soldiers the right way in order to help them achieve their goals, overcome deficiencies, and to push them to accomplish great things takes time. I think we would all agree that we counsel soldiers constantly, mostly by verbal means. There are times when a written counseling statement must be done, usually on a quarterly basis or when the situation arises. This helps your soldier to mold their future military career and it is important that it be done correctly. I was always told by my superiors that you promote yourself. It takes time to do a proper counseling, but our responsibility is to our soldiers and service to them. Help them be their best. I always enjoy watching people succeed. I am amazed at the physical fitness of our soldiers. As our unit has been named Outstanding Company in our battalion and has been recognized for outstanding accomplishments within our brigade, it makes me proud to be with a group of such remarkable people. Everyone is willing to help those who are struggling, or even those that do well and need a boost. We have all been there. To me, there is no greater sense of pride than seeing an individual succeed. It is always difficult to watch someone fall short of their goal. APFT, Weight Control, promotions, whatever their hope may be, it is difficult to watch someone fail. As leaders, we can offer help and encouragement with the intention of pushing our soldiers to be their best and to achieve great things. I feel that that is something that I try to do every day. What skills does it take to succeed in the job? Be organized. If you cannot manage your time, get your paperwork in order, or assemble soldiers to do what is needed, you will have problems. Of course, these are things that can help with any endeavor in the military or in civilian life. Be positive. Anyone can have a bad day. Be that positive element that can help someone pick themselves up after a setback. Motivate. The mind will quit before the body. These days, people tend to give up too easily. Try to be the motivational engine that will keep people moving in the right direction. Unfortunately, we have had soldiers separated from our unit due to APFT failure and/or weight standard failure. I feel responsible that this happened. These were great people that did an outstanding job at contributing to our unit. What would have happened if I had kept in better contact between drills, or talked to them about their progress instead of simply recording the score/weight on the counseling statements? The bottom line is, I should have done a better job. If I had the opportunity to do it over again, I would take a more active role in the progress of my soldiers. A simple text, email, phone call would have allowed me to have contact with those individuals and might have allowed them to have the encouragement needed to overcome the obstacle. Never underestimate the power of showing interest in your people. What are your best three success tips for someone doing this job? Be a positive influence on your soldiers. Show them that you care. Ask about their families and civilian jobs. There is more to them than just what you see in the military. Go over rewards and consequences regarding physical fitness and set goals for greater responsibility. Make them understand that their physical fitness has a direct result on their future. This is important. Be the leader, set the example, show them the way. Be patient. If a soldier is struggling with the APFT or weight control help them work through the problem and help them come up with a plan of action. They didn’t get that way overnight. They will not reverse it overnight either. Show support, offer help, even set up a workout regimen that will push them to improvement. Our unit even set up a web page specifically for that purpose. Whatever works, help your soldiers in any way possible. As a member of the National Guard, I feel physical fitness and weight control are the hardest standards to maintain. Together, we can help each other and make a difference. 1SG Luzzi enlisted in the Arkansas Army National Guard in 2002. 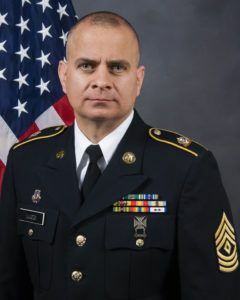 He attended Basic Combat Training at Fort Knox, KY and was assigned to the 106th Army Band where he has remained for 16-years. He has attended every NCO PME through Master Leader Course and was named 2011 Army Bands NCO of the Year for the Reserve Component. In addition to his military Service, 1SG Luzzi is in his 24th year as a music educator spending 9-years as the assistant band director at Lakeside High School in Hot Springs, AR and 15-years as the band director at Searcy High School in Searcy, AR. He lives in Searcy with his wife Dawna.